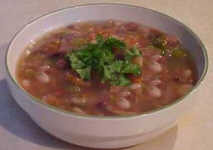 The name Frijoles Borrachos literally means "drunken beans" because they are cooked in beer. The slight bitterness of the hops in the beer give this tasty Mexican soup a unique flavor. The soup can take hours of preparation if you soak the beans and then simmer them until they are tender. However, by using canned pinto beans, this soup can be made in 15 minutes. Heat the oil in a pot and saute the chopped onion. Add the pepper, tomato, beans, and water. Add the beer slowly so that it does not foam excessively. Stir, and season with salt and pepper. When the soup comes to a boil, add the chopped cilantro and stir.